Food: Trail mix, water and hot chocolate provided. Medical Restrictions: This is a physical activity and it is the guest's responsibility to determine that they are physically and mentally able to participate in the activity. 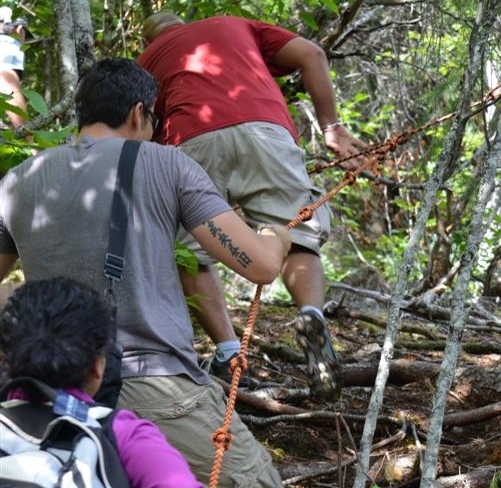 Join experienced guides on an exciting hiking adventure through the Tongass Rainforest that immerses you in the incredible beauty of Southeast Alaska. Your adventure will begin with a guided driving town tour of Skagway and continue up the White Pass on the Klondike Highway. Along the way your guide will regale you with history about the Klondike Gold Rush and the natural history of the area. From the trailhead you will spend the next 2 hours hiking through the beautiful alpine forest surrounded by the towering snow capped mountains of the White Pass. 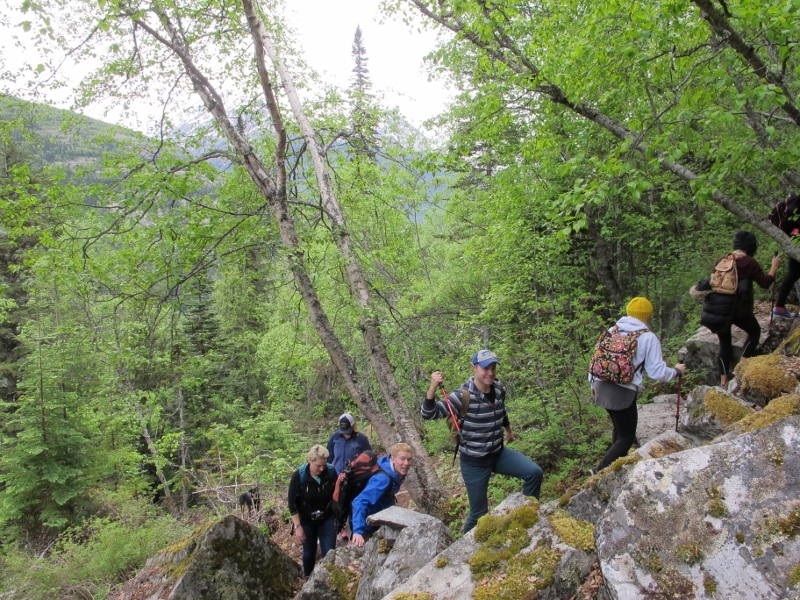 Your naturalist guides will stop frequently along the way to share their knowledge about the native flora, fauna, and to describe the amazing glacial history of Alaska. Each group is outfitted with binoculars to maximize your opportunities to see up close the spectacular mountain and river scenery. 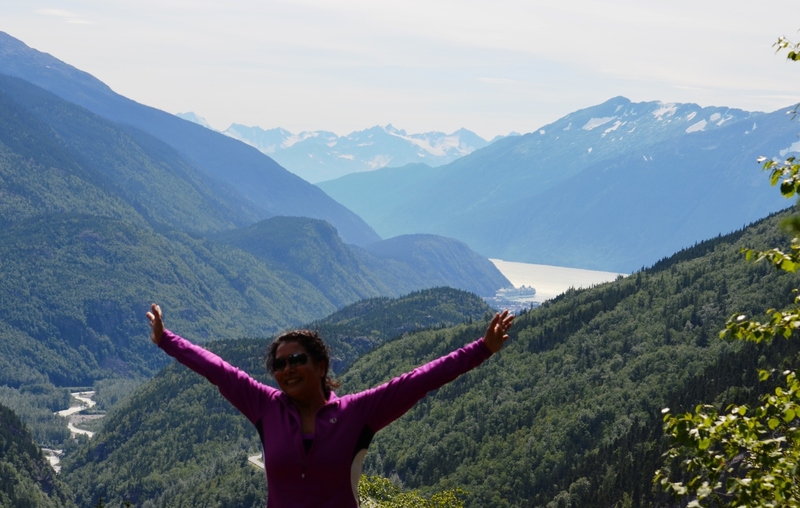 Midway through the hike you will be treated to a delicious snack at the final breathtaking overlook with incredible views of the Skagway valley, White Pass, and the Lynn Canal. This is a great active family experience and kids are welcome (minimum age of 6). Bring your camera!! (~10 minutes) - Your friendly guide will meet you near the Skagway Small Boat harbor sign and restrooms. Here they will take the opportunity to get to know you and provide answers to any questions that you might have about your upcoming excursion. (~ 15 minutes) - We’ll depart from our meeting point by van for an interpretive driving tour of historic downtown Skagway on our way up the Klondike Highway to our private Porcupine Mountain trailhead. (~15 minutes) - Once we arrive a short walk will bring us to the trailhead where your guide will provide a safety briefing and get you outfitted with trekking poles for the hike. 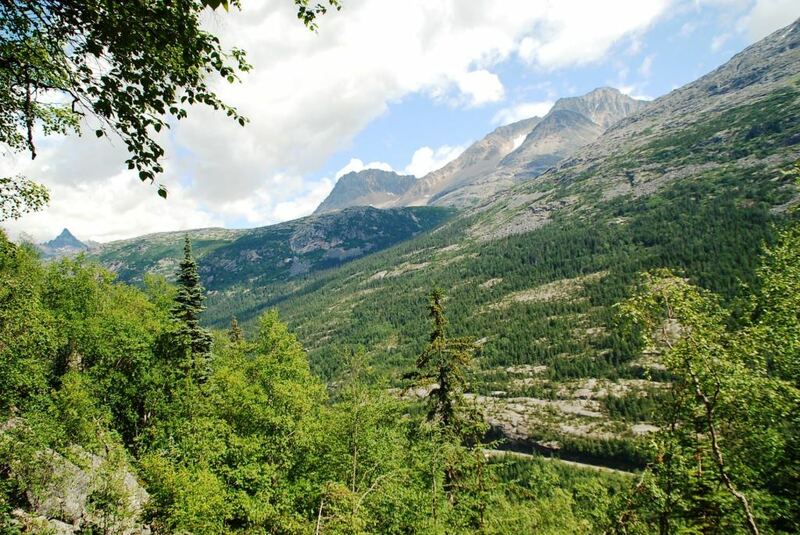 (~110 minutes) - From here we’ll continue uphill along the trail stopping at a series of scenic viewpoints that take in the vistas of the Skagway Valley and White Pass. Along the way, your expert guide will share their knowledge of the native flora and fauna and the unique geological history of the area as we pass through multiple ecosystems. After a rest at the last viewpoint we’ll head back down the trail to our rough-cut timber kiosk for some hot cocoa and trail mix. (~15 minutes) - We’ll depart the trail for a scenic ride back through the Skagway Valley and back to town. 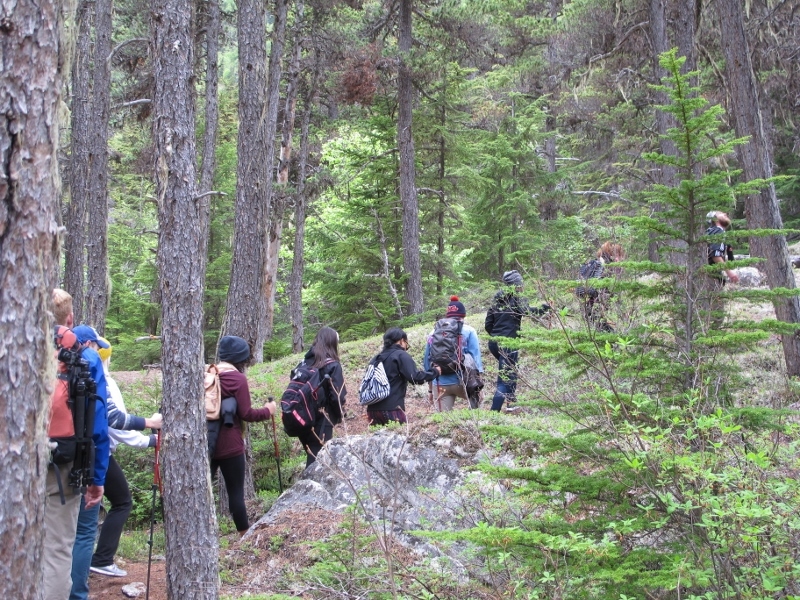 You’ll be hiking over uneven, natural terrain. There are exposed roots, rocks and sometimes slippery and muddy sections. 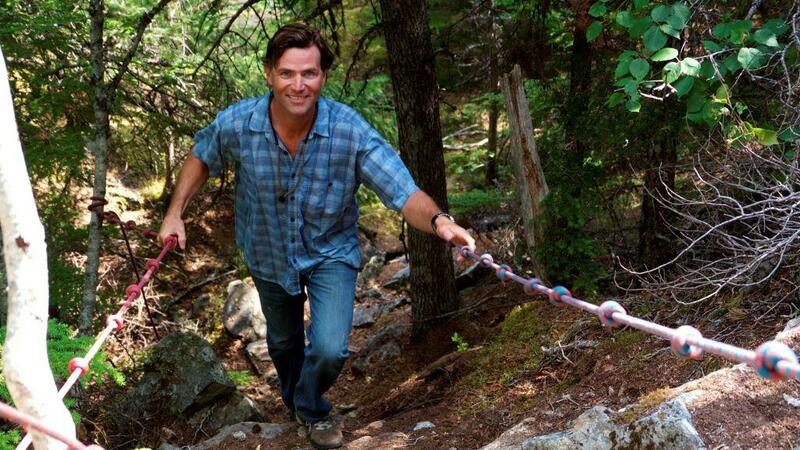 In certain sections we’ll use hand lines to help with getting up and down some steeper parts of the trail. Hayden & Timmy. These men brought the perfect combination of youth and professionalism to the hiking tour. They were very knowledgeable of the land and animals. Our group felt safe throughout the tour and didn’t have any problems. Hayden and Timmy kept us entertained and informed during our adventure. They were the best tour guides we’ve experienced on this cruise by far. We really appreciate all they did for us and we hope to see them again!